Looking for female superhero merch? Here’s a helpful list! It’s clear to anyone who follows this blog that I’m a huge fan of Marvel, both the films and of course, the comics. There is however, one major problem I have with the unfortunate direction Marvel continually seems to go towards in regards to both their films and merchandising. Before I get into that, I would like to first acknowledge the wonderful job Marvel has done with its comics, showcasing some wonderfully well-written female-lead titles such as Black Widow, Ms. Marvel, Captain Marvel, She-Hulk, Elektra, Storm, Angela, A- Force and Spider-Gwen. My criticism is rooted mostly in an unfortunate trend happening with the Marvel Cinematic Universe and its merchandising. While I do believe that the MCU does include some very intelligent, strong and complex female characters, the problem lies in the fact that they, and their fans are often underrepresented. Plot points aside, what I’m getting at is the lack of availability and promotion that has been given to both their female characters as well as their female fanbase. Upon a few of my recent trips to Target Stores, I have ended up leaving the store rolling my eyes because the toy aisle, despite its huge Age of Ultron banners and end cap displays, have repeatedly failed to include both images and toys of Black Widow or Scarlet Witch. Yes, Hawkeye isn’t always on everything but I think it’s safe to say he’s most certainly included on far more. A similar story can be said for Gamora’s representation when Guardians of the Galaxy was being heavily promoted. We can have a raccoon and a tree, but apparently, not a woman. On a similar note, I recently visited several stores in search of girl superhero onesies for a baby shower that I was attending. While I found a plethora of options in the little boys section, the girls’ section was a veritable wasteland and was instead filled with princess after princess. It’s a similar story when comparing the t-shirt offerings in the men and women’s departments (thankfully though, there are far less princess items in this situation). While I have found, on rare occasions, a few in-store items from time to time, it certainly hasn’t been easy and the pickings have most certainly been slim. 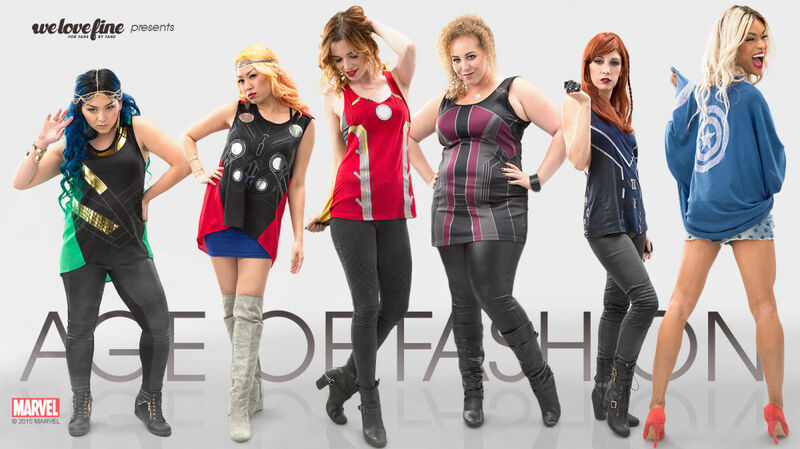 HerUnivese and Hottopic’s Marvel fashion line. 2. WeLoveFine – WeLoveFine is another website that while selling merch featuring male heroes and men’s fit apparel, also has an amazing selection of female hero merch and merch made to fit females. Be sure to check out the amazing dresses! 3. Hottopic – Mall staple Hottopic has certainly upped their game over the last year to offer up some great items including a limited edition clothing line teaming up with HerUniverse focusing on the Avengers and Loki. Sadly though, those items look to be nearing the end of their stock (due to the immense popularity) but Hottopic has also featured a healthy amount of tshirts in women’s fit that include Black Widow. 4. Funko Pop – While the options are severely limited when it comes to the official Hasbro action figures, FunkoPop offers plenty of female character options including Gamora, Thor’s Lady Sif, Nebula, Harley Quinn, Wonder Woman, Batgirl, two versions of Black Widow, and more! 5. TeeFury – TeeFury has been a major player in the shrinking of my wallet. While they originally started with an ever changing daily tee option, they have since expanded greatly to offer a wide variety of female characters and always with a women’s fit option. I have them to thank for my many Agent Carter t-shirts as well as a few Black Widow and Spider Gwen ones as well. Additionally, I’m happy to see that DC is focusing on a line of products on young versions of their heroines with DC Superhero Girls which is features the “unprecedented Initiative to Include Digital Content, TV Specials, Made-For-Videos, Publishing, Toys, Apparel and Other Products”. If you know of any other inclusive sources for geek female centered merch, please leave a link in the comments! Be forewarned. There will be some mild spoilers. Last night I attended a screening of Marvel’s Ant-Man along with my usual movie going crew which included a very intense yet lovable Puppet Loki, at the recently remodeled Regal Webster Place Theater in Chicago. I really didn’t have very much background knowledge of Ant-Man or his world going into this film, a fact that I feel only helped me to enjoy it that much more. While I understand that Marvel Studios isn’t going to follow the comics exactly and has on many occasions taken liberties with their characters’ origins and adventures, it’s difficult to not be disappointed when ones favorite elements are removed. Due to this unfamiliarity, it was a refreshing change of pace walking into a Marvel film having very little in the way of specific expectations. 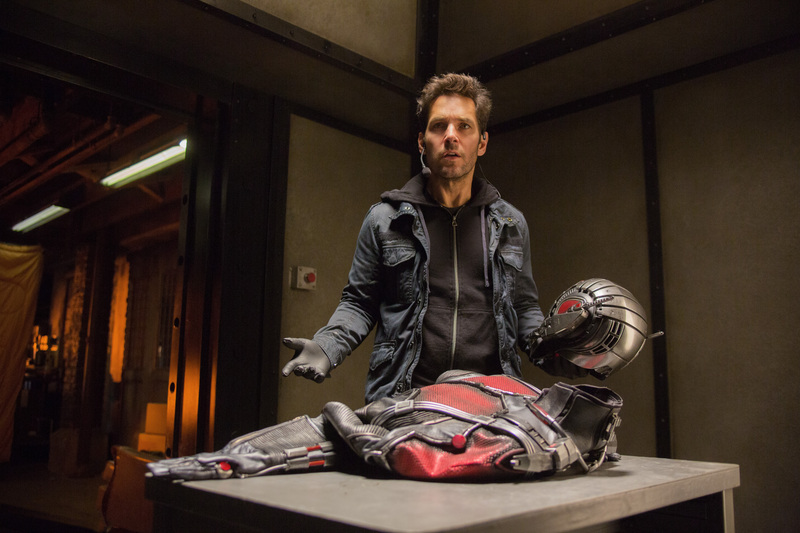 Unlike The Avengers: Age of Ultron, Ant-Man is a much smaller film (no pun intended…okay well maybe a little). By smaller I mean a simpler, more straightforward and focused film. Granted, Ultron dealt with a much larger cast with an extensive backstory while also mixing in origin stories for newer characters as well as a complex villian, so a little messiness is to be expected to a certain degree. The immediate draw for Ant-Man, aside from it being a Marvel Studios film, because let’s face it, Marvel pretty much has a super-powered hold on my wallet for as long as they make these movies, is the charming Paul Rudd. 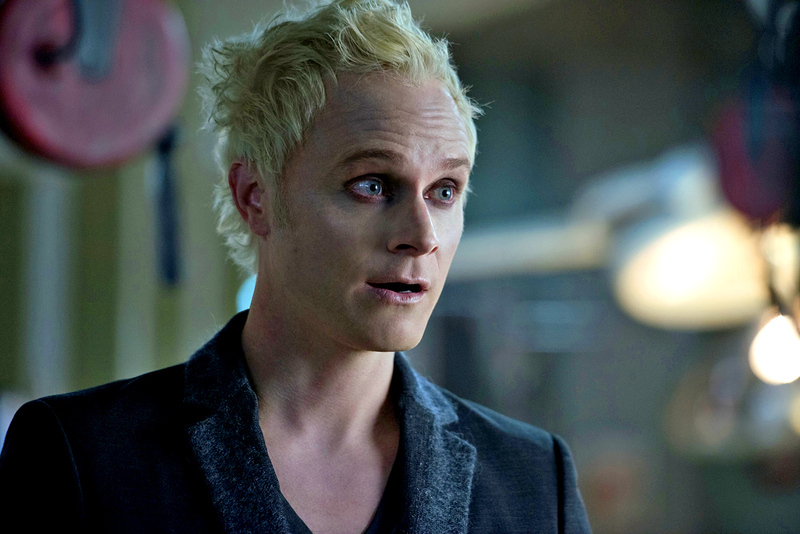 Rudd (who must be a vampire of some sort because seriously, does he even age?!) plays the Robin Hood-esqe Scott Lang who after just being released from a three-year stint at San Quentin Prison tries to live a burgle free life in an attempt to be a part of his young daughter’s life. However, as he sadly and quickly learns, not everyone is thrilled to hire an ex-con. Lang soon finds himself, along with his best friend Luis, played by the hilariously perfect Michael Peña and his wise-cracking heist crew, back in the game. It is not long before Lang encounters world renowned scientist Hank Pym (Michael Douglas) and his daughter Hope Van Dyne (Evangeline Lilly) and finds himself thrust into the responsibilites, powers, and history surrounding the Ant-Man suit. Ant-Man is typically at its best when Lang is working with his crew who are the film’s very effective and entertaining comic relief and one can only hope we see more of them in future Marvel Studio films. 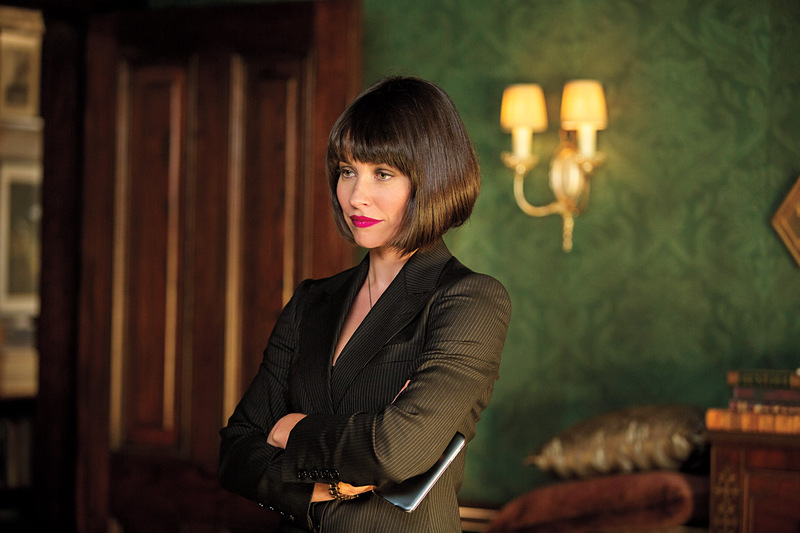 Comic relief aside, Evangeline Lilly‘s Hope Van Dyne is a quite the scene-stealer herself, as a complex and confident woman who refreshingly does not get damseled. 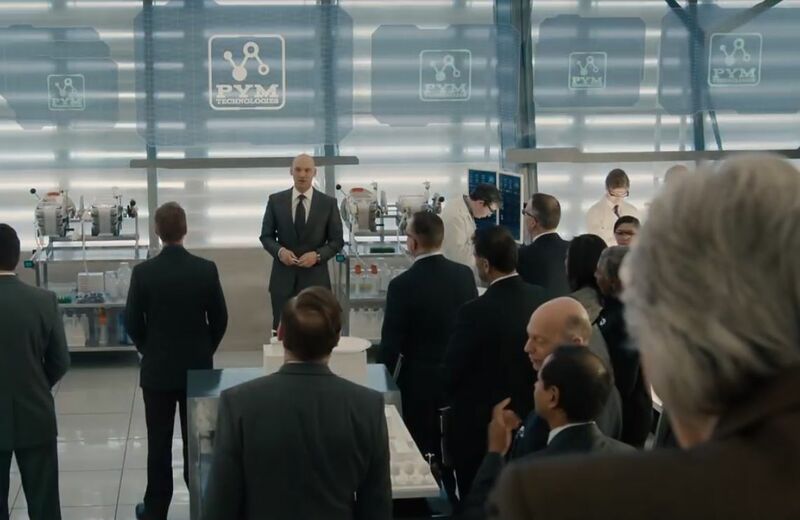 Throughout the film, Hope repeatedly pleads with her father to let her don the Ant-Man suit but alas, due to the death of her mother, her father does not yield in his stance. While the fact that we don’t get to see Hope in full-action mode is frustrating, Hank Pym’s motivation is understandable and the impression is never given that his stance on the subject is due to the belief that his daughter isn’t skilled or intelligent enough. It comes down to the fact that she is his only family left and he just can’t bear to risk it. Hope repeatedly shows that she is more than capable on many levels and is a welcome addition to Marvel’s roster of complex, intelligent and strong female characters. However, I feel the need to state, Black Widow’s multiple contributions aside, it has been long overdue for more of these ladies to suit up and lead the fight in these films (Captain Marvel just can’t come soon enough!!!). That being said, the mid-credits scene gives me hope for Hope’s future (hehe), because Marvel, it really is “about damn time”. Aside from Lilly, Ant-Man also features the immensely talented but consistently under utilized Judy Greer who has already experienced a very similar placement in this summer’s Jurrassic World in which she is once again, the protective mother who scolds others for their behavior. Aside from Greer’s unfortunate typecasting, other room for improvement in Ant-Man comes in the way of its villain, Darren Cross a.k.a. Yellow Jacket played by Corey Stoll. Though Stoll does a solid job at playing the unhinged cold hearted antagonist, perhaps a little more insight into his history with Pym and emotional motivations would have made the villain’s presence more captivating and memorable. Overall, Ant-Man is a fun, focused and refreshing entry into the Marvel Cinematic Universe that benefits from its separation from the events currently unfolding in its other films while still managing to maintain a few small connections (seriously no pun intended that time!) . What did you think about the film? Share your likes and dislikes in the comments, but please, always be respectful. In my previous post, I shared images from the Lightfoils show at Schubas on Monday 29th. In addition to Lightfoils’ performance, the headliner, Alex Winston also put on an captivating show. Winston, who is wrapping up a month long tour with the Neon Trees, is currently promoting her upcoming EP, “The Day I Died“. Check out the video for her latest single, “Careless“. Alex Winston live at Schubas in Chicago, IL. On Monday, June 29th, the Lightfoils took the stage again after a nearly eight month break. If you are not familiar with Lightfoils, they are described as having, “hazy soundscapes, ringing guitar, icy synth, feather-light vocals”, essentially they fall into the shoegaze/dreampop category. You can check out some of their work on Saint Marie Records.